I was a little worried since light colors are a bit more difficult for me to work with, but I think I managed pretty well. I left more of the original sketch than usual so there's more definition in the white areas. As a result it's got a sketchier look but I think it's pretty cool that way. His tail looks way longer than it actually is because I attempted to give everything a more dynamic appearance to better illustrate the future savior of Equestria. It wasn't often that Earth Writer sat down to take stock of his supply of cousins. While his family were by no means so widespread as, say, the Apple Clan, he could find blood relations in pretty much every area of Equestria if he looked hard enough. The search could sometimes prove difficult, given that distant relatives tended to stay distant. Without something like a common crop to serve as a family tartan, clans dispersed and stayed out of contact for the most part. This was on the whole unfortunate, but it did mean that when there were reunions, the journalist could count on meeting all sorts of interesting ponies. So, when he heard that a distant cousin from the Stalliongrad branch of the family was actually a guard stationed in Canterlot, Earth decided to write this Dawnguard a quick note, asking if it would be alright for him to come by the barracks when his shift was over. Always good to meet a new cousin, after all. ~ Secretly unearthed family relations? Reunions spanning across the great expanse of time and country? Other Avengers of the Raging Riptide sharing in the wealth of their shared blood of heroes?! Yes...yes, he could feel it in his spear hoof. The Dawn was rising. Though it wasn't as if he had been expecting anything even remotely similar to the letter he'd had received during the weekly distribution of mail and packages to all the soldiers. Oh sure, Dawnguard received a letter from his mother every few weeks, and returned them with all due haste, and his younger sister often sent him candy, an exceedingly delicious variant of licorice that he had to hide in an armor display case to keep it out from the grasping hooves of his barrack mates. But never before had he received an official missive of wayward cousins and desired meetings, a call to unite those whose veins coursed with the blood of heroes. Would it be safe? Dawnguard wasn't sure. Too many hooves of Righteous Fury in an enclosed space could havecataclysmic results...but he had to take that chance. Because the forces of Evil in Equestria awaited no one, and to bring together two souls of Justice was too powerful a chance to miss. And also he'd cleaned his armor about a hundred and one times that week, he needed something else to do for pity's sake. And so it was with great flourish that Dawnguard wrote a returning letter, expressing the design of the fates for the two estranged cousins to meet and affirm the blood of heroes within them. Just in time as well, for the Pegasus had no sooner slipped his letter into the outgoing mail when his Sergeant was bellowing for a line-up, causing the young stallion to barely avoid tripping on his spear as he hastily joined his unit. Until that fated morn... Or, afternoon, or evening. ~ It was afternoon. At least, afternoon from the perspective of most ponies. It might as well have been morning for Earth Writer, who had just woken up half an hour ago. Journalists and other Bohemians tended to not have steady sleep cycles, and were often seen patronizing the sort of establishments open at half-past two in the morning, alongside even less respectable ponies. Earth Writer was certainly dressed like somepony who didn't care what the respectable thought of him. A Brown Trilby with his press card in the band, grey shirt, bright orange tie, and powder blue jacket made for an ensemble that caused many a noble to look askance. But he didn't care! Today, he was going to meet a new cousin, and wouldn't you know it, there was a young guards pony approaching him now. Earth waved over at him. "Hello there! I take it you're Dawnguard?" ~ His team-up sense was tingling. And for good reason too! Even relaxed and refreshed as he was - for there was nothing quite as refreshing as a brisk shower after an intense training session that had left him feeling like an unfortunately delicate flower under the maddened wheels of a runaway carriage - Dawnguard could sense that sudden change, the slightest shift in the wind that turned his head around, slowly, a moment perfectly frozen in time as his eyes sought out his fated meeting with - A-wuh? Hmm. Dawnguard wasn't sure exactly why, but for some reason he'd been expecting...something else. Perhaps another suit of armor, or maybe even a hammer and majestic red cape. Though the bright orange tie did stick out rather nicely against the blue jacket. Ah, no matter! His kin of blood was here, and the white Pegasus couldn't keep the grin off his face as he trot forward, a spring in his step as if he hadn't had any training today at all. "Ho, my good cousin!" he called out as he came close enough to hear the Unicorn's own greeting, and ignored the waving hoof to grab the other stallion in a full embrace. "By my twitching spear hoof, how fortuitous our meeting! 'Twas not mere chance, but fated by the red threads of providence before our time! WHAT SAY YOU?" ~ Of all the things Earth Writer had been expecting.... this had been pretty far down the list, judging from the surprised "Guh!" Being the only response the unicorn could muster to the unexpected hug. "Need... to breathe..." It took a minute for him to extricate himself from Danwguard's grip, and to regard the stallion more closely. Never before, outside of some very amateur theatrical productions, had he ever encountered a stallion quite so... hammy. 'By my twitching spear hoof?' Really? "Me? I'm just wondering if you're like this all the time, or just putting on a show for me." ~ Well that was a silly inquiry. "Not just for you, for every - hey wait, that's not the point!" Dawngaurd exclaimed as his brain caught up with the knee-jerk remark, frowning a bit at the Unicorn still clenched within his forelegs. It was...true, that he sometimes, occasionally had to practice his heroic speeches in a mirror, and sometimes rewrites were required. Because "Dispenser of Lone Wolf Justice that Makes All Evil Tremble in Front of my Mighty Spear Hoof" did not sound as good as "Avenger of Justice Who Delivers All from the Black Void by his Righteous Wrath." The white Pegasus eventually let the Unicorn go however, the strange question not doing enough to deter the REA guard from the excitement of meeting an unknown fellow of his blood. "How were your travels, my good cousin?" he questioned genially, adjusting his spear to lean it over the other shoulder, "'Tis hopeful you did not run afoul of any woebegone demons of ill whilst you traveled from...from...er, where abouts did you travel from, again?" ~ Oh-ho, so he put on this sort of show for everypony, did he? That was too rich. Earth had met many an eccentric in his career, but this was a new one for the collection. He had an urge, almost, to take him around the city and show him off. Which would be a little cruel, perhaps, but entertaining. "Uh, travels?" The unicorn shook his head. "I live here, actually. Moved out to the big city after getting my education, and starved in a garret until I found work for the Canterlot Chronicle. Of course, I don't know if you've been down to the Artist's quarter; it's like a whole different city from the famed White Marble palaces of Canterlot." The reporter smiled at Dawnguard, a plan forming in his mind. "Actually, would you like to go? I know of a few places that are well worth seeing." ~ Aaah, a fellow Canterlot dweller then? Dawnguard nodded sagely as if he'd known all along, even though he could have sworn Earth Writer's note mentioned needing to travel to meet him at the barracks. Somewhere between his loudly written pleasure of discovering the bloodline of heroes amongst his family and a wish to enact their faced meeting bespoken upon his third eye. Mmm...yes, yes. It was definitely in there, somewhere. But no matter! The white Pegasus continued to nod his head, ears perking as the other stallion suggested a tour of Canterlot. Or at least a side of Canterlot he had yet to see. "An excellent idea, my most introspective friend! It is true, I've yet to spread my Wings of Valor over these...Artist's Quarter. Let us venture forth and cleave a path of righteousness!" Dawnguard exclaimed, and shifted his spear again to give his cousin an expectant look, armor gleaming in the sunlight. As it should, considering it's one hundred and one cleanings just that week! ~ "Be careful that you don't actually hit any pony when you're 'cleaving a path of righteousness' with your 'spear of justice.' Pedestrians tend to take a rather dim view of that sort of thing." With an amused smirk, Earth Writer gave a mock salute to the guard, and took the lead down the cobbled streets of Canterlot. You could mark the boundaries of the Artist's quarter of the city accurately enough by demarking the streets where carved marble was replaced with brickwork, somewhat South and East of the University. After two blocks of student housing, you began to see old apartments and studios that were inhabited by starving artists, much like migrating colonies of bats. Lights would go on at all hours of the night, and there was always a strain of music coming from somewhere. Often, it was two clashing strains, which tended to lead to an altercation between competing schools of music. Today, Jazz was holding court on the streets, and Earth Writer tossed a bit into the hat of a busking saxophonist as he passed. "You really should see the place at night, of course. All sorts come out to have a good time. Even a few slumming nobles." ~ Ah yes, of course. His cousin was well aware of the mighty power contained within his right hoof that threatened to break forth with each and every passing moment, potentially bringing about cataclysmic events of unparalleled disaster upon the innocent. The blood of heroes was strong in him, indeed! The fact that he and his mysterious cousin were so alike was almost enough to send Dawnguard skipping down the streets, but he was able to restrain himself well enough as the duo took off, down into the hustle and bustle of Canterlot until it became more of a...low and sedated hum, rather than a hustle. The area was entirely different from what the white Pegasus was used to, gleaming white towers replaced by brick and mortar. It was almost as if he'd stepped into a different world! "Nighttime does herald the calling of wayward souls together in the harmonic dissonance of Good vs Evil, true," Dawnguard agreed, unaware of his hind leg tapping slightly in rhythm to the saxophone player. "But where the righteous congregate, so do the forces of the blackened Void, who'd see our fair country torn in 'twain! What manner of surveillance and protection do the citizens of these Quarters see from the valiant guard, cousin?" the Pegasus demanded, head casting side to side. ~ Again with the rhetoric! Earth Writer couldn't help but be impressed at how natural Dawnguard made it sound, however. Most ponies he knew who talked like that were unsuccessful theatricals trying to attain and retain attention from the audience. "Eh, it comes and goes, depending on how long it's been since any pony did something impressively illegal here. Not much in the way of major villainy happens here, and the petty stuff is generally taken care of without assistance." Sometimes, true, the methods used could be grounds for calling in the guards, such as when a photographer chased a welching debtor down the street using his tripod like a lance. It made life piquant here, though, and furnished journalists with a constant source of copy. ~ Hmm...hmm. Dawnguard wasn't sure if he fully believed that...but then again, it was very obvious his stalwart cousin was more attuned to their current environment than the white Pegasus himself. Still, with the bloodline of heroes coursing through his veins, Dawnguard cast another watchful glance around the Quarters, warily taking in the rounded sun high in the sky. Not close to nighttime, not yet...the forces of Evil would be amassing. Soon. Which left them plenty of time to keep exploring this area, something that had Dawnguard grinning in anticipation. "The Artisan keeps his trade treasured and cherished like a fabled weapon of old, I see," he nodded. "'Tis admirable, yes...admirable indeed!" ~ Earth looked a little sideways at Dawnguard, trying to determine if that sentence was just fluff said for the sake of saying something, or if some actual meaning was to be put behind it. In the end, the journalist decided to answer as if it were the latter, as it allowed him to pontificate on his own views of art. "There's something in that. Oh, I don't mind art for art's sake, but there's always been something... pugnacious, I think, about the greatest works of art. They say something that the artist would be willing to defend, even if it be their own pacifism. It aims to strike and conquer the heart." "Speaking of which... have you ever given thought to creative effort yourself? I write a bit, of course, but I could name a few amateur actor groups that wouldn't mind having you about." ~ Like his willingness to defend his stash of candy from wily barrack mates who did not understand the meaning of hoof's off! Yes, Dawnguard shared in these artist's pain. That moment of bonding over imagined and future slights tugged at his core, prompting the white Pegasus to set down his own bit into the musician's upturned hat. "May your haunting melodies strike fear into the hearts of your enemies," Dawnguard murmured, spear hoof curling in front of his chest, "or at least cause some mild ear aches." Earth Writer spoke up then, causing Dawngaurd to return his attention back onto his cousin, super serious expression fading into some surprise at the inquiry - though it didn't last. "Oh yeah," he said earnestly, pleasure spreading across his face, "Ma says I'm a natural! I write all my stuff myse - I mean," he backtracked, "such might have been my destiny in another world, but in this one, 'tis my sworn duty as a Chosen One, to bring an end to all strife and conflict." Hmm...that would make an excellent chapter in his story. A magical portal that teleported him to an alternate universe where he was never born a hero, forcing him, Dawnguard, to bring peace and tranquility to an Equestria completely overrun by the avaricious forces of Evil until he sacrificed all to bring about the defeat of the True Emperor of All True Evil...of All Time. He needed to write that down before he forget. Blast, he never had his parchment and quill when he truly needed them! Something Earth Writer had said stood out, however, and it was only a moment later that Dawnguard figured it out, his ears once again swiveling towards his cousin curiously. "You write?" he repeated, a bit needlessly. "Ha! It runs in the family, I see! And what is it you have written? Epic ballads? Serious dramas? Tales of your heroic exploits of heroic legends in heroic iambic pentameter?" ~ Earth Writer frowned a bit at the ear ache remark. "I don't think anything's worth compromising the quality of one's work. I don't have many scruples, but that's one of them." The unicorn had to raise an eyebrow at what, for all intents and purposes, seemed to be a moment of lucidity. So, this all was practiced and written beforehand? His mother was right about him being a natural, though the guard was bound to be typecast for every part, now. "All strife and conflict, eh? Well, good freaking luck with that." The journalist had seen too much of both to believe that one hammy pegasus could accomplish that particular destine. "And I write... well, mostly about the ponies and places I've seen. Non-fiction, mostly expansions upon my articles that wouldn't fit in the paper. I've a notion of publishing them one day." ~ "I should think so as well," Dawnguard retorted, firstly addressing the Unicorn's confusing comment, "but what one pony deems 'quality' differs from one to another, does it not? The arts are, in their very nature, subjective to the wills and whim of ponykind." At least that's what he learned from his sister. The bugle horns of the honor guard rang like the sweetest peals of Justice in his ears, but she claimed them to be nothing but the headache-inducing warblings of a dying hydra. Poor naive, little sister. Earth Writer spoke up about his writings though, and despite himself, Dawnguard couldn't help feel a bit disappointed. Nonfiction...sounded so boring. Unless it was nonfiction about a Princess, or the beloved Elements of Harmony, or something equally righteous. Otherwise... Well, sometimes interesting and semi-righteous things happened in unusual places, so there was simply no telling the wondrous things Earth Writer may have been privileged witness to in his lifetime. "Ah!" Dawnguard exclaimed, a curious look overtaking his face, "cementing your heroic exploits in quill and parchment, for the future generations to read upon its long-aged wisdom, eh? What sights have you played witness too, good cousin, that has been and will be immortalized in your writing?" ~ There were few things Earth Writer liked better than a good argument. Even if the dispute were over an idle remark, he'd keep it in play for the sheer conversational sport of the thing. But, as Dawnguard was speaking in terms of one of the reporter's few sacred principles, the unicorn was especially determined to remediate his art schooling. "Multiplicity of kind does not affect the question of degree, and vice versa. For every thing a pony can do, there is a way of doing it badly, and a way of doing it well. And one ought to do a thing the best one can." Of course, Dawnguard had his own bugbears of the mind, to which he was perpetually returning. Acts of heroism, eh? "Heh," he muttered and shook his head. "I'm a journalist. I record the news, I don't make it. And I've been everywhere, man. To a city that lives off of art like most of us do bread, to a town of false fears made true, to the center of an undreamed-of war, to the place where we dream of a peace beyond our knowledge. How do you like that for a jacket cover, eh?" As much as their outlook on life might differ, the two stallions did have a similar gift in language, it seemed ~ Now Dawngaurd was even more confused, so much so that he hardly heard the Unicorn's explanation on his writings. From what he could tell, it seemed Earth Writer had misinterpreted his earlier statement, because Dawnguard could only conclude that the two were debating very different topics. "Wuh?" the white Pegasus said intelligently, focusing on the first bit of their conversation, "you misunderstand, my good cousin. Degree is not in question, not by my fair thinking. I simply meant to say how, hmm...say, that good musician there," he extrapolated, pointing a hoof towards the saxophone player they'd just passed, "may play to the best of his valorous abilities, yet a pony may complain of an ear ache from his enchanting melodies, simply by virtue of their own opinion." Dawnguard really wasn't sure what had sparked this debate, especially since he agreed with the Unicorn's opinion on performing to the best of one's abilities. Perhaps his cousin believed that he, Dawnguard, had advised the saxophonist to deliberately downgrade his skills in order to strike fear into the beating hearts of his enemies? Which was just silly. Everyone knew a mighty spear was a far better tool for that! ~ Earth Writer waved a hoof at Dawnguard's point, though whether in approval or dismissal was hard to judge. "If a pony cannot appreciate good art, that is a misfortune to be commiserated. But that is so, I refuse to give any consideration to their opinion. They who cannot appreciate the good have no right to judge the bad." He gave a frustrated sigh. "You would not believe the number of philistines that we have had to deal with down here." ~ Ah-hah! So there lay the issue, and it was enough to induce a nod of shared contention from the white Pegasus. "I cannot begin to comprehend your artist pain," Dawnguard bemoaned, reaching out to sling a comparable foreleg around his cousin, "nor the pain of these Quarters, for those that offer upon the world their sacrificial talents, only for them to be swept under the rug like an depraved bunny of dust." Evil, evil bunnies of dust. "But!" he exclaimed suddenly, with a friendly and powerful smack on his relative's shoulder "'tis good to rejoice, this bond we share, eh cousin? When the fates aligned this meeting of heroism betwixt two of the heroes' blood, I had no knowledge of how much in common we would have! What's good is good, be it music or art or the bloodline of heroes, and the bad may fall to the wayside before the mightiness of the dawning sun!" ~ Earth Writer had to admit, it was a bit of a surprise how much they had in common. A reporter who'd seen too much of life to spout idealistic cant, and a guard still innocent enough to say such stuff sincerely. And yet... at the very core of themselves, a commonality. Thus it was that the reporter decided to offer Dawnguard an invitation he rarely extended to non-artists. "Say... I was thinking about getting dinner at the Veiled Garden. I don't think you've even been there, it's one of the best-kept secrets of the Quarter. But... I think they'll like you there." ~ Dawnguard gave his cousin another amiable slap on the shoulder as he stepped back a pace, now doubly pleased he'd agreed to meet said long-lost relative. To think he shared so much in common with another family member, once, twice, six times removed - well, it was a wonderful feeling. Some relatives never even got along at all, much less shared a bond of their caliber. The mention of dinner shook the white stallion out of his thoughts however, head tilting inquisitively. "The Veiled Garden, you say?" Dawnguard murmured, stroking a hoof against his chin, and almost felt a small little shiver go up his spin. Yes...yes. This restaurant's name sounded...mysterious. Alluring. A perfect place for their dual-creative minds to sit down, enjoy a nice meal, and strategize to ward off the forces of Evil. "A most excellent suggestion!" Dawnguard bawled a moment later, one hoof raising triumphantly into the air. "Let us go then, to this shrouded garden of unfathomable righteousness, and partake upon a feast to fuel our never-ending quest for Avenging...Avengness!" Thoughts of cucumber and mulberry sandwiches already filling up his mind, the white Pegasus wasted no more time hefting up his spear as he started down the street, stopping a moment later to turn back to Earth Writer. "Er - and whereabouts may we be Avenging towards, my good cousin?" ~ An amused smile played around Earth Writer's face. "I'm not sure any pony I know would call it a 'garden of righteousness.' Your sort don't normally patronize the establishment; it's mostly actors, authors, artists, reporters, and other such reprobates." The personality clash alone would make a show worth the price of admission. And since the price was 'free,' it was an unbeatable value! "We'll find the entrance down this street. Well, one of the entrances. I think it's the best; the effect of the architecture and landscaping is second to none when you catch it at the right angle." So far, however, this 'right angle' was leading them to what looked like the wrong side of town. Or, at least, the downside of whatever curve most ponies hoped they'd bought property on the upside of. Moss of a decidedly unattractive greenish-grey grew through the mortal of the brickwork now, which was bolted as best it could to what looked like the refuse of a granite quarry, banged into a perpendicular front. This depressing wall dipped for a moment into an alley, barred by an iron gate. "It's not actually locked." The reporter explained, as he fiddled with it. "You just need to know the right buttons- aha!" With a clank, the gates opened, revealing a short brick path with a sharp turn ten feet in. Following that path would lead to- Verdant overhangs of vines, coloring the reddening sky of sunset as the pair looked into a lush landscape, with winding paths commanded by a dais and porch, where already ponies were gathering around a bar, the strains of a guitar in the air. The reporter had trotted ahead, just to see the look on Dawnguard's face when he saw it. "Nothing like it in all the city. Nor in all the world, leastaways the parts I've seen." ~ Dawnguard was well and truly flummoxed. For, by passing through the somewhat decrepit looking entrance way, the white Pegasus had entered outside rather than in, and the illusion was so powerful that he was literally stymied for a moment, standing at the entrance with his bottom jaw dropped like foundering fish upon land. All of his keen and precise senses were narrowing in on a single feeling, one that encompassed everything the garden of righteousness exhibited. Cool. "By, my, twitching spear hoof," Dawnguard breathed, taking a few steps further in as his head twisted this way and that, as if to take in every single aspect of the establishment, "what manner of magic is this? Such a verdant spread amidst yonder walls..." Or least he assumed there were walls yonder. They had walked into a building had they not? There had to be walls somewhere...even if he couldn't exactly see them. "How...how, under the great broiling sun, has this wondrous establishment escaped the attention of every hoofed being in the magnificent land of our country?!" ~ Ponies up on the veranda began to turn in interest towards Dawnguard, guessing from his manner that he was an actor. Possibly, this was the evening's entertainment! In any case, it was a free show, of the sort Bohemians tended to appreciate. Earth Writer, for his own part, laughed out loud at his cousin's reaction. "I'm afraid I can't give you a detailed explanation of how they did it. You'd have to ask the architect, and he's been dead for fifty years now. As for why it's not more well known..." He shrugged. "You saw what sort of neighborhood we're in. This is a city where ponies value the appearance of virtue even more than its substance." ~ What a shame, that such a wondrous place was not more well-known. A cry against ponykind! ...Then again, perhaps such was for the best? Where beauty and purity lingered, so was Evil drawn to it, to corrupt and mar and taint with its villainous black heart. Perhaps some things were simply left unknown to the world at large, so that they may remain floating above the dark, black waters of the unjust and impure. "Yes," Dawnguard murmured, right hoof curling in front of his chest again, "yes, perhaps, for the sake of its beauty and innocence, things must be protected by...not protecting them. Openly. In the open." Hnnrgh, he needed to work on a good 'protection' reel. But that would be later, because right now, there was the Veiled Garden in all its splendor to partake of! "And where does a Warrior of Light indulge in the unfortunate mortality of his stomach? The bar? To the bar!" Dawnguard exclaimed, slinging a foreleg around Earth Writer and attempting to drag the Unicorn towards said bar. For all the ravenous hunger gnawing at his belly, it was if he hadn't taken his lunch after his shift the day. Which he totally had, but that wasn't so important right now. ~ Hm, it would appear that Dawnguard's impromptu repertoire could use a little work. Earth Writer might have considered arranging for lessons, if it weren't for the fact that his cousin was so amusing when stuck for a line. Probably best to keep his skill level where it was; otherwise, ponies might go from thinking the pegasus a mere performer to someone actually insane. "Seems you've grasped our little paradox. Life's full of little contradictions like that. I'll have to point out a few examples sometime about how things can be concealed by drawing attention to them." He laughed, even as he was being dragged to the bar. After all, he was by no means averse to that location. Taking his regular position, he nodded to the barkeep. "We're on my tab. Two sandwiches for afternoon breakfast; I'll take egg and tomato on mine, how about you?" ~ Ah-hah, a passing of introductions to directly partake of their meal? His esteemed cousin was surely a prominent, or at the very least, continued patron of this Veiled Garden. It vaguely reminded Dawnguard of that one dinner he'd shared with Darkness Knight, a valiant champion of the Blackened Void of night, where the other Pegasus had led him to a rather posh restaurant to feat upon the most succulent of foods. Thankfully, Earth Writer hadn't taken him to a private table in the far back of the area, however, which already made this experience less awkward than his last. "A cucumber and mulberry sandwich, good maiden," the white Pegasus exclaimed, taking a seat next to his cousin, "and a glass of your finest barley water, if it pleases you!" As soon as his order had been given, Dawnguard turned back to the Unicorn, curiosity sparking in his eyes. "You frequent this establishment, it is clear to see," he stated, though with a bit of inflection at the end of his comment. "Exactly how many seasons have you spent exploring this veritable garden of bliss, my dear cousin?" ~ The mare at the bar raised her brows at Dawnguard's order, tilting her head as she looked over at Earth Writer as if to ask 'is this guy really serious?' The Unicorn could only nod solemnly. "He takes life... well, honestly, more seriously than most of us, I'll bet." The barmaid shot back. "Yeah, well, the only thing we serve that's made from barely and water is beer; and I ain't serving that to a guard unless he's off duty." He waved a hoof. "Just water and lemon, then." He said, before turning back to his cousin. "I've been coming here for... four years, now? Ever since I joined the Chronicle." ~ Hrngh, no barley water? A real shame, that, as barley water was quite refreshing. The same sort of, tang a bag of green tea had on ice cold water, except a bit stronger. Still, 'twas pointless to complain about it, and in all honesty Dawnguard didn't mind all that much, because 'ye alicorns! Sandwiches! Of the mulberry and cucumber variety! The white Pegasus barely contained from rubbing his hooves in glee, as he had more important things to attend to, such as restraining the excitable build up of power in his spear hoof from spilling over and annihilating every poor pony in its path. The responsibility of his bestowed power...it was almost too much to bear sometimes. "<i>Chronicle</i>?" Dawnguard piped up, shifting a bit in his seat as his golden armor settled in some uncomfortable places. "That is the paper on which you transcribe your visions seen across the great expanse of the world?" He wasn't familiar with it...but then again, Dawnguard received all his news from the REA, firsthoof. ~ "Ye-e-es." Earth Writer was now looking at Dawnguard sideways, elongating his enunciation in incredulity. The pegasus spoke as if he had never heard of the paper, which to the Journalist was absurd. "The Canterlot Chronicle. The biggest Daily Paper in all the Foothills and Heartland." He would have said the biggest in Equestria, but the Manehattan Times had them beat for circulation numbers. "You've... never read any of my articles before now, have you?" ~ "I have not," Dawnguard admitted honestly, without any trepidation or hesitation. "For a Chosen One, the universe speaks unto my inner core, the changes in the world that quicken and recede like a mighty wave..." Or, wait, no, the tide was the better analogy to changes coming and going. Argh, he always forgot! "Plus, I get pretty much all the news I need from command," the white Pegasus continued abruptly, "and my bunk mates! I tell you cousin, nothing spreads faster outside of the barracks." Like a group of chittering old mares they were, gossiping hither about the going-ons in the city and the suspiciously secret looks the higher-ups gave each other over something. Utter bedlam. ...Not, that he knew anything about the gossip circles throughout the barracks, no. No, he'd just <i>heard.</i> ~ "In other words..." Earth Writer's voice began to be colored with a sardonic tone, "Your idea of a hero is a pony who gets all his information from rumor and heresay." It might have been a little mean, but to so ignore a pony's calling like that was by no means an unhurtful thing. It would be as if the unicorn had said that ponies who cared for justice were unnecessary in modern Equestria. Which would have been unfair. ~ What had begun as just a hint suddenly took a turn, causing Dawnguard to pause in his glances around the Garden as the Unicorn's voice gained a hint of scorn to it. The words, too, had his forehead furrowing downwards as well, in confusion rather than disdain. By the Void, his cousin was a knowledgable pony, of that he had no question, but speaking with him was akin to wandering the most circular of mazes. One thing said could lead directly to something anew or completely changed, and it was no easy task keeping up. "My dear cousin," Dawnguard began, just as slowly as the Unicorn had moment's before, "do you often attribute one trait or observation to be equal to the whole? Is a mind for artistic quality the <i>only</i> trait of an open-minded individual?" ~ The unicorn's lips, unconsciously, twitched into a smile. His needling had provoked a response, and now he could have a vigorous discussion over breakfast. It was almost as good as coffee, and as he had both... well! He'd be all gunned up and ready for a hard night's work! "A trait may be what we call... representative of the whole. A stallion who thinks nothing of speaking to shame a mare's appearance, for instance, is likely to have a great many other unpleasant qualities. Others follow logically from each other; I never met an open-minded pony who did not have some appreciation of art." He sipped his coffee. "And I never met a pony who was content to merely believe heresay reports of events without doing any confirming work that wasn't a fool in other respects." ~ More valleys to navigate within, his dear cousin. Dawnguard had the sneaking suspicion that were he to spend any further time with the silver-tongued Unicorn in the future, he'd need to invest in a thesaurus! Or rather, a much more extensive thesaurus than his current one. But the white Pegasus was at least able to pick up on at least one more interesting fact about his cousin, causing an appreciative grin to light up his face. "Ah, like how all journalists twist and bend the truth in order to sell their stories," Dawnguard stated, remembering a rather...passionate, rant one of his sister had given after a particularly vicious article published against their mother's city-wide policies. "Yes, I suppose I see your point," he conceded after a slow moment, though with much more reluctance than his previous statement. It would not exactly be...proper, to explain that the "single source" of his news came from the most trustworthy, what being the REA and all. Gossip was one thing, but a news article about a break-out fight within the commons paled in comparison to an actual debriefing of the event. "So then, you base your judgements of one pony's self on any such singular trait?" Dawnguard pressed, leaning forward against the bar slightly, "Enough to confront them about it?" He'd actually never thought about it that way, when he went about his business, but now that Earth Writer had brought it up, Dawnguard could make sense of it - evil was evil, a singularly revolting trait indeed! "Such are the similarities between us, Cousin! For a thief who steals into the night to take what belongs not to them, is surely Evil-bred from dawn to dusk!" ~ Earth Writer had enough of a sense of humor to take Dawnguard's jibe at his profession in stride. It was exactly the sort of banter he faced... pretty much every time he came into the Veiled Garden, actually. Not for nothing were journalists lumped among the Bohemian reprobates by the more bourgeois ponies of Canterlot. "I just hand in the copy; the lies are inserted afterwards by the Editor." The playful cynicism was not without a soupçon of truth, but the unicorn had long since reconciled himself to living in an unperfect world. "Of course, the key thing about journalism is the fact that the daily paper is, well, daily. I have to get my facts, impressions, and judgments quickly because the column spaces need filling every 24 hours. I have to write and think in shorthoof." He held up his notebook in example, it being full of such scribbles that would be incomprehensible to any pony outside his profession. "Hence the need to draw parallels in personality from what I can see." He took another bite from his sandwich, chewing over words in his mind as well as the food in his mouth. "One difference," He mused, after swallowing, "When I confront a pony, it's usually in order to listen to what they have to say for themselves, which usually gives a more complex picture than initial impressions would suggest. And that's when you have to put in the legwork to get at the Truth. Now, whether the Truth makes it in print is another story." ~ The white Pegasus wasn't entirely certain if Earth Unicorn was simply acting in jest about the reputation of his occupation, causing his eyebrows to furrow downward. A pony of valor and justice would irrefutably deny any claims of blackened lies in his work, undoubtedly, but his cousin merely shrugged them off, like a power attack glancing off the indisputable might of his spear. Was it true? Did editors mess with the articles after they were hoofed in for inspection, inserting their words of un-truth to make a story more interesting? And Earth Writer was alright with it? Or maybe he was simply reading too much into the playful statement, because his cousin's honeyed words could make anyone's head spin! But hmm, there was a key point, that. Though it seemed contradicted by his earlier statement, if Dawnguard were keeping up with his quick-witted cousin as well as he hoped. "But, as you say, you have little to no time to investigate these Truths," the REA officer objected, sandwich held in front of his mouth as if he'd simply forgotten it was there to eat. "Surely you are unable to discover any further than your initial impression at times, what with the fleeting whims of circumstances and fate. And you must discern truth from those singular impressions - such as Evil!" ~ "It all depends, honestly, on whether the editor is willing to run multi-day stories, or be willing to run a dull paper on Saturday for a better one on Sunday." Realities of business often went hoof-in-hoof with the reality of news, or its falsity. "There's always something there to dig for, but we have to decide if its worth the effort to find out? Often that comes in terms of cost/benefit analysis done on the back of cocktail napkins." ~ Dawngaurd was now confused, a feat he could readily admit was a relatively easy feat to achieve when sitting across from the Unicorn he was...well. Sitting across from. "So," he started slowly, confusion coating his voice, "you know there is truth in everything you are recording, yet only sometimes decide to discover it? And of these times you choose not to pursue truth, you proceed to present only the first impressions and singularities you have found as the truth?" So then...Earth Writer did follow his own ideal of discerning Evil with a single glance...but only part of the time? "And you are okay with this, Cousin?" ~ Earth raised an eyebrow at his cousin over coffee. He'd gathered, as an impression, that Dawnguard had a significant degree of naiveté, and had inwardly been attempting to judge whether or not it would be worth the effort to educate this stallion. Probably not, but he at least had to try, for the honor of the family, if nothing else. "Uh-huh. You see, the way the world actually works is considerably different from the Fairy tales they print in books. Or on the front page, for that matter. Evil is rarely found pure in a pony; it's mixed with other qualities, and generally there's an explanation more than 'he's just a bad pony' for why they act the way they do. Many a bully was made that way by a bad parent, and many a robber baron fancies himself a Robin Hood." "And then there's me." He chuckled. "I've often had to act quite rudely to get the interviews that give me my daily bread. And the press churns on, giving us a sigh of relief every day to find that the leading article is not printed up-side down, nor Princess Celestia congratulated upon discovering the North Pole. Sheer bloody accident accounts for a lot more than ponies suppose." ~ "But you have failed to answer my inquiry," Dawnguard pointed out, now so engrossed in Earth Writer's confusing back-and-forth that he was leaning rather precariously on his stool, sandwich in constant peril of slipping from his hooves. "You say that evil is mixed with other qualities - " other qualities such as EVIL, a fact that the white Pegasus would need to correct his cousin on in a moment - "and that there may be an explanation...and yet, you have no qualms ignoring said explanation when time is running short? You sit well with yourself, painting Evil as Evil in your news stories when such, in your belief, may not be the case?" Maybe his sister had been right? Earth Writer acknowledged that there may be two Evil sides to evil, yet he was committed to finding those two sides only when it suited his timetable - and if it didn't, then the one side of Evil was published. From everything Earth Writer had said, it was, in fact, the journalists who wrote in lies and falsehoods in order to push a story out on time. Perhaps not done on purpose, or with maliciousness...but done all the same. ~ "Ask your commanding officer some time what the REA could do if it had infinite time and resources. It doesn't, so it has to prioritize their allocation, and things have to slip through the cracks." Pretty big things, sometimes. Such as a mad returning monarch and two invasion forces. But, those would have been cheap shots. "I treasure the times when I can dig in, and have to live with the times I do not. I write the Truth as far as I know it in the time I'm allowed. And if I get it wrong, there's usually a letter sent in to the editor to correct it." ~ Erp. His direct commanding officer, mayhaps...but the one that really mattered to Dawnguard? At least in terms of disappointing him with a potentially silly question such as that? He shuddered to think of it. But that was food for a different thought, and the food he was partaking of was for something entirely different. "You speak of different circumstances," Dawnguard protested, sandwich completely forgotten in his hooves as he struggled to come up with a fitting analogy. "I may have some rendezvous to make, but a tight deadline will not prevent a Chosen Warrior of Light from responding to a desperate cry for Righteousness!" The thought was utterly abhorrent, and the white Pegasus didn't know of a single REA member who would ignore a cry for help in favor of making roll call on time. ~ "Now there's an interesting point." A careful listener might have detected a shift in Earth Writer's tone. The sense of playful banter had gone, replaced with... something else. Steel, though whether in the form of a backbone or a blade was hard to tell. "That sort of attitude would explain why the REA couldn't put together a defensive line during the first changeling invasion. Miss your rendezvous points, and you leave gaps for the enemy to drive right through." His tone wasn't... accusatory, but it was firm in its declarations. "I can't fault you for courage or good intentions, but those aren't what makes a military effective. Discipline and organization mean more in the long run." ~ Any other example of the lack of foresight the otherwise heroic REA had admittedly made, Dawnguard might have acquiesced. But the battle where is own father had risked life and limb to save those more helpless than he was not one of them, and it showed as the white Pegasus' faced darkened slightly. "Not all enemies force their way through sheer blundering," the REA officer retorted, "but instead rely on trickery and dark magics to enchant those who would fight for Good - even to the highest level." That the two Princesses had been just as unaware of the imposter posing as their niece and fellow Princess was a point that had been made quite profusely by most dissenters of their Righteous reign. To Dawnguard however, such a point merely drove him how exceedingly Wicked the forces of Evil were. "You believe, then, that one life means nothing," the white Pegasus pressed. "That a Hero should, when faced with the option of saving one life, simply - pass by, for discipline's sake? That is the Righteousness you seek in the Royal Equestrian Army?" ~ Earth Writer wasn't about to be talked down by an idealistic private. Dawnguard may have idolized the officers in charge of the defense of Canterlot, but the journalist had been on the ground when it happened, and had seen the impact of that failure to "hold the line" with his own two eyes. "The trouble with you, and all those who refuse to have any kind of sympathy with those that they call 'Evil', is that you have no real way of dealing with the sort of things they actually do. Such things are unthinkable to you, therefore, you never think about them, and can't counter them. "But I'll absolve the commander of that failure; it wasn't as if he didn't have a plan." The unicorn reached into his jacket pocket, to pull out a folded street map of Canterlot, unfolding it on the bar table. Using a pencil to sketch and point out features, Earth ran rapidly through what he'd picked up from his after-the-fact interviews with the officers. "Granted a total enemy infiltration of the city, which is a worst case scenario, there really isn't a good quick way of getting rid of them... save magical serendipity, but neither you nor I can cast spells of that caliber, so we'll leave that aside." He circled the three Canterlot Guard stations immediately surrounding the Palace. "Now, the plan was to set up defensive perimeters immediately around the stations, and then expand them out, pushing back the invaders and letting the civilians filter into safety. But, given the numbers involved, and the fact that the changelings could fly, it required total coordination and discipline to pull off, especially between the ground guards and the pegasi. But... discipline broke down, resulting in a city where no place was ultimately safe." Earth Writer sighed and shook his head. "It's not that I believe one life means nothing. It's just that I recognize the dilemma of the one vs. the many. And as a guard... you have a responsibility to the many." ~ In all truth, what his cousin knew of the Canterlot Invasion, at least as it happened in the moment, was about as much as the white Pegasus knew himself. He'd been but a small lad - well, not <i>that</i> small, riding just on the cusp of Righteous stallionhood - when the Changelings had invaded. News of his father's heroic deeds had been, in fact, the trigger into earning his cutie mark. But the precursor into this sudden explanation was utterly confusing, a fact that the REA officer sought to rectify immediately. "And how, pray tell, would sympathy for these Evil Doers have prevented them from infiltrating and knocking down our defense?" Dawnguard questioned, head tilt to one side inquisitively. What did it matter how much he, <i>sympathized</i> with a Changling that was charging its way towards him? Especially when their existence had not even been conceived of before that very invasion! 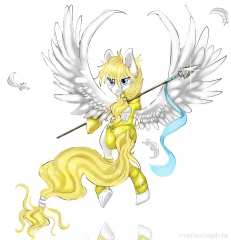 "The many is comprised of the few," the white Pegasus continued onwards, an insistent tone in his voice. "What company of Heroes could the REA claim to be, abandoning the one in times of need? That is exactly what <i>EVIL</i> craves, to have the Righteous compartmentalize lives as nothing more than a single unit of measurement, instead of the individual and unique flames each soul represents. Such generalizing is how the tyrant Queen reigns in her subjects, stripping them of identity and reducing them to numbers on parchment!" ~ Earth Writer sighed. Of course, at the tactical level, it was hard to put his ideas across, and as Dawnguard was a private, the tactical would be all the pegasus had any sort of knowledge of. "Pre-battle intelligence, or even being aware that one has enemies, requires espionage. Espionage requires that one be able to convincingly imitate one's enemies as one travels among them. And to convincingly imitate, one must understand what they are all about. And to understand another, one must feel what they feel." "And furthermore," The reporter went on, his own voice rising to meet the insistent tone of his cousin. "What do you actually know about the Changeling Hive, hm? Have you gone and seen it for yourself? Have you taken any time to sit down and listen to a changeling speak for himself? Have you even talked to any pony who has? You keep making these assertions to justify your attitudes, but I happen to know in this case that you insist falsely. Changelings have names, and the Queen knows them. The knowledge may be used for good, or evil, but for all that, we do not have the right to condemn her people to death by starvation. And if we're to find some alternative to an endless war of extermination, we cannot treat our negotiating partners like comic-book villains!" ~ Dawnguard did not fail to notice how his stalwart cousin had ignored the implications of reduced individuality concerning Equestria's own citizens, instead jumping on the idea of Changelings being...well, the Pegasus wasn't even sure how this conversation had come up. He'd questioned Earth Writer about the concept of individual worth, but the Unicorn had twisted their discussion onto the very nature of Good and Evil. He was beginning to sense a pattern in his cousin's verbal debates. "Where abouts has this arisen from, Cousin?" Dawnguard questioned, genuine confusion and incredibility entering his voice. "I asked you not of Changelings, but of our own citizens you feel amount to nothing more than numbers! And you speak of insisting falsely," he continued, eyes narrowing a bit, "but what proof have you that the Tyrant Queen knows the names of <i>every</i> individual in her armies, not just the useful ones? What truths do you have, that she does not simply categorize the foot soldiers? Such is the intelligence <i>we</i>," here, the white Pegasus gestured quite empathetically to the star on his breastplate, "have gained, knowledge that - if you'll forgive me, dear cousin, has been gained from the securest of sources." After all, any newspaper that claimed to have accurate and reputable information that the Equestrian <i>government</i> was not aware of was, quite frankly, kidding itself. ~ It was true, Earth Writer had been guilty of a digression. His style of verbal fencing often involved a lot of ducking and weaving, which was particularly useful when he felt that he didn't have a good reply to the subject at hoof. By talking up a point he did know something about, he could buy his brain time enough to catch up to the conversation. At this point, he was prepared now to answer his cousin's original question, though now the reporter unicorn needed to clean up the digression he'd thrown out. "You are cloudy in your point-making. There is a pretty big distinction between recognizing no individuality in a being, and not knowing that being's name. If it comes down to mere memorization, I doubt if even Princess Celestia knows the name offhand of every guard in the REA. She has better things to do with her time. That far up, you can only give orders in a general sense in any case, evaluations of individual capabilities are trusted to NCO's and junior officers, who are closer to the privates. "In any case, I'm by no means so confident in our intelligence, given that it never saw Nightmare Moon coming, gave no warning of the first or second Changeling Invasions, nor of the Caribou attack on the Crystal Empire." He refrained from mentioning Discord, Sombra, or Tirek, as Earth Writer had to concede in the first two cases that no warning could possibly have been given before the event, and in the latter warning had been given... though the actual plans to take care of the matter left a few things to be desired. "Even if I grant the point that our Intel services give good information, clearly somepony somewhere is not actually paying attention to what they are saying. Again, failure of discipline." Having cleared the field of his own caltrops, he rounded upon Dawnguard with the summation of his point. "But to return to your original point on the value of individual Equestrian citizens against multiple, let this individual Equestrian give his point of view: If I had been saved by you, or somepony like you, and later found out that you had let 5 die to save me, I should feel as if I had killed those five with my own hooves. If, on the other hand, I saw you pass by me to save those five, I should have felt that my sacrifice had contributed to your heroism. If the word 'Citizen' does not imply some degree of self-discipline and self-sacrifice for the good of our country and our fellows... then it means nothing!" He set down his cup with the force and finality of the judge's gavel. He had made his point and philosophy clear, and felt in no mood to argue further. After all, at some point today he needed to get around to actually working. ~ Such an abhorrent thought, so much so that Dawnguard was figuratively floored - and literally rooted to his perched position on the bar stool. "But you'd trust your own intelligence far so the better," he said incredulously, the words lacking an inquisitive timbre as the Pegasus recalled Earth Writer's seemingly confident words that implied intimate knowledge of the Tyrant Queen and her inner workings. "I fail to recall any such forewarnings from the citizens of Equestria before any such events." And it was perhaps foalish to try and compare the majestic REA to a newspaper, especially when Dawnguard had to, reluctantly, concede the Unicorn's point on the illl-prepared guard in the face of Equestria's most dire moments. Even if many of those threats had been so far out of their league even their Righteous Blazing Rulers of Sun and Moon had been blindsided and completely neutralized. But still, to be talked to as if the Unicorn's information was so much more accurate than the countless and tireless efforts of the REA, of the <i>General</i>, was more than Dawnguard could bare. His cousin could not claim to have more precise knowledge of events yet disparage the REA's lack of foresight working off of <i>less</i> accurate information. "And this you think should be known fact, Cousin?" the white Pegasus finished, "that your life would cost the lives of five others? When in the rage of battle and blood, the bloodline of heroes calling out to someone in distress, a Chosen One should just ignore them for the chance of saving five others? Or, perhaps, to simply stand in line for a muster of the troops? Knowingly trading a life for what may or may not be - that, dear cousin, is exactly the mentality that strips the word 'Citizen' of its worth, and makes it mean nothing!" His spear hoof came down on the bar with force, an unconscious imitation of Earth Writer's own cup hitting the surface - though, he brought it back a moment later as he felt something wet dripping down his hoof. The remains of his poor, neglected sandwich greeted him from all over his hoof, particularly on the bottom where he'd unintentionally squashed the sandwich he'd clutched through the entire debate onto the bar top. And as if on cue, a pang of hunger shot through his stomach. "BY MY TWITCHING SPEAR HOOF," Dawnguard cried out, his clean foreleg wrapped around his stomach as another pang of hunger ripped through him, "my sandwich! How many ways do the Forces of Evil deign to sunder me vulnerable, by enticing such arguments of Good and Righteousness with my dear cousin!...hungry..." ~ Having stepped back from the bar, Earth Writer was now in a position to see what the rest of the customers had been making of their little spat. Bohemians all, they treated it like a piece of free theater, well acted, with genuine emotion! And such clever construction, too, soaring high into a debate on serious public matters, before descending to bathos with a bump and splatter of sandwiches. The audience then duly laughed and applauded at Dawnguard, which can't have been good for the poor young stallion's ego. The unicorn took pity on his cousin. "You can put another sandwich on my tab; I've got to get to work now." He didn't continue the argument, it was done. Or, if not done, at least the impasse had been met, and there was no point in beating a tired horse to death. ~ So fixated on the pitiful remains of his ill-gotten sandwich was he, that it took Dawnguard another moment to understand the sounds he was hearing as riotous applause, prompting him to glance upwards from squished mulberries to the other pantheons of the Bohemian, seated at various intervals. It took the white Pegasus even longer to realize they were applauding <i>him</i>, for whatever reason, and once he had, he could do nothing more than raise a hoof towards the crowd. Hesitantly at first - just to make sure, you know - then with more gusto as the cheers for a reigning Champion of Light fell forth from the crowd. And perhaps even more than that, his stalwart cousin offered another sandwich to satiate the hunger gnawing at his belly. "A most generous offer, Cousin!" Dawnguard exclaimed, though he was a little added by his impending parting. Though they had clearly not agreed on certain Righteous issues, dining with Earth Writer had been...an experience. "But never fear," he abruptly continued after a moment, "for we shall meet again. It has been fated of the stars..." Or, wait, was that his rise as the Last True Hero of Equestria? Was he mixing up his prophecies again? Bah, no matter. Dawnguard hopped down from his own stool to grab his cousin in an earnest bear hug, near lifting the other stallion off the ground, before setting him back down with a hardy slap to the shoulder and turning back towards the bar to claim his reward. "Fair barmaid! Another mulberry and cucumber sandwich, if you will! The righteous fury of my twitching spear hoof is ever rising...can't...control!..." ~ In truth, Earth Writer had been about to take his leave, having granted the Bohemians this evening's performance. Thus, his cousin's sudden seizing of his person caught him off-guard. "Bwah! Uh, ah, yeah. You're welcome." Taking a little time to dust himself back off, he re-oriented himself towards the exit. "I'll be sure to see you again, of course; after all, we're in the same city now. It's not that big. And more than likely you'll be on-site next time there's some big story I have to cover." Finally, he was off to actually do some work... but caution led him to give a parting shot: "DO keep that spear hoof of yours under control; I am not paying for any property damage it inflicts."